Have you ever been to a Global Marijuana March? The Global Marijuana March is exactly that. A global cannabis reform rally where stoner activists from all around the globe converge on their local main street in support of cannabis law reform. They go from varying degrees of attendance, from a few dozen in one town to thousands in others. The Marijuana March is a staple in modern cannabis revival efforts, as it shows that this isn’t just a local issue, but a global one. Angola. Argentina. Australia. Austria. Belarus. Belgium. Bermuda. Brazil. Bulgaria. Cambodia. Canada. Cape Verde. Chile. Colombia. Croatia. Cyprus. Czech Republic. Denmark. Finland. France. Germany. Greece. Guyana. Hungary. Iceland. Indonesia. Ireland. Israel. Italy. Jamaica. Japan. Lithuania. Luxembourg. Mexico. Moldova. Nepal. Netherlands. New Zealand. Norway. Peru. Philippines. Poland. Portugal. Puerto Rico. Romania. Russia. Serbia. Slovakia. Slovenia. South Africa. Spain. Sweden. Switzerland. Trinidad and Tobago. Turkey. Ukraine. United Kingdom. United States of America. Uruguay. Venezuela. and Vietnam. I’ve been to two Marches in the past. Er, actually, I missed the march one year, but made it to the rally at Southmoreland Park afterwards. The first time I went I went with Libby and Nikole, the two friends of mine who really got me active. We went and hung out in the park after blazing a fat doob, and played some hack. It was definitely a nice ice breaker for my first brush with actual in-the-flesh activism. Nice and chill and didn’t scare me off of future confrontations. The second time I went was last year. Again at Southmoreland, and again, I missed the actual march. However, I did make it to the rally once again. 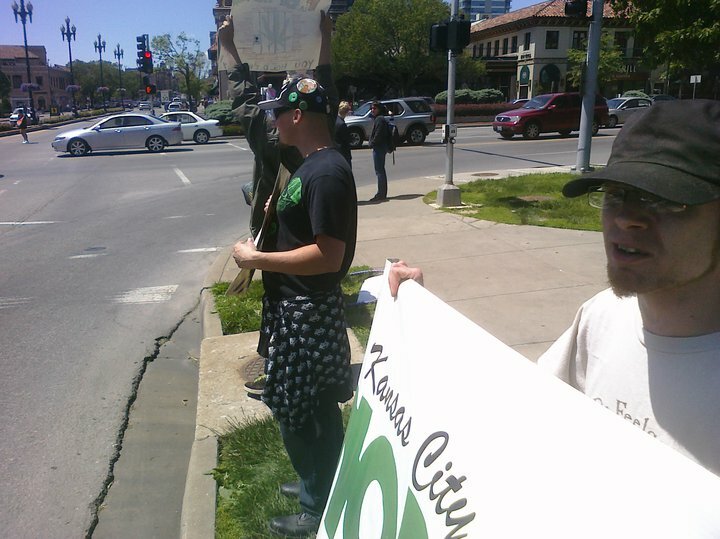 We stood on the corner and shouted pro weed slogans to numerous supportive cars. 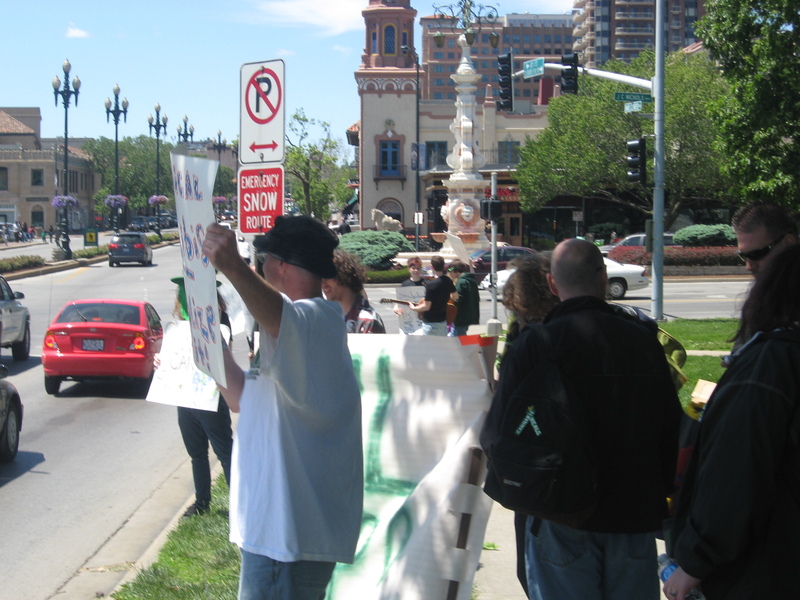 In fact, that’s where I first met Kyle, who would later that year go on to start our local NORML chapter, in person. It was a beautiful day, and if I remember correctly, I jammed with a few people who had brought guitars. I had my trusty Hohner and we let it rip. Another great time. Another shot from 2010. I hope to shoot a bit for 2011... Video too, hopefully! 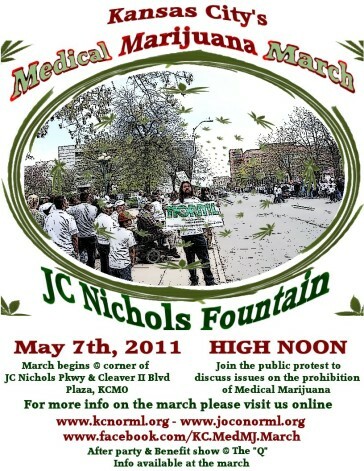 On May 7th, 2011 we will meet at the JC Nichols Fountain on the Plaza to hold a protest and a march through the Plaza. This years March will start at high noon and we will be having guests speakers and rally at the fountain untill 3pm. This will also include family gathering, and activities. SCAVENGER HUNT, RAFFLES, AUCTIONS ALL NATURAL FOOD and some great prizes up for grabs for showing your support. Farr and Fuggins Wheat, Brother Bagman, MindzEye Lovellution, The Phenometrons, Arm The Poor, The Phantastics, Brendan Macnaughton, Rusty Buckets, and Jamie Phalen. We will also be holding raffles, live paintings, scavenger hunts, and of course lots of great prizes up for grabs. Music and festivities will run till 1am at The “Q”. The benefit show is suggested $5 donation at the door. That means 9 HOURS OF LIVE MUSIC FOR 5$!!! And supporting a great cause at the same time. Yeah. What that said. I know I’m gonna be there, along with my lovely partner in crime and a bunch of JoCoNORML homies. If you’re around KC or gonna be in Kansas City that weekend, it would definitely be worth checking out. And, if you do go and see me, feel free to say ‘what up’. Just tell me the Practical Toker sent ya. Join us at the South Riverside Park at Central and Nims near the Keeper of the Plains from 11:30am-1:30pm. Bring your home-made signs and your loud voices! This is a non-smoking event. 😉 For more information, contact Debby Moore aka The Hemp Lady at debby (at) hempforus.com 316-524-6001 Hope to see you there! So, if you’re in Kansas, but KC is too far away, how about Wichita? The more the merrier, people. I don’t care if you’re in Timbuktu, time to get active on this one. Numbers speak volumes, yo.